A genteel Medicine Buddha on handmade paper in Eldorado canyon with a doe. Medicine Buddha is invoked for healing physical, mental and emotional illness. 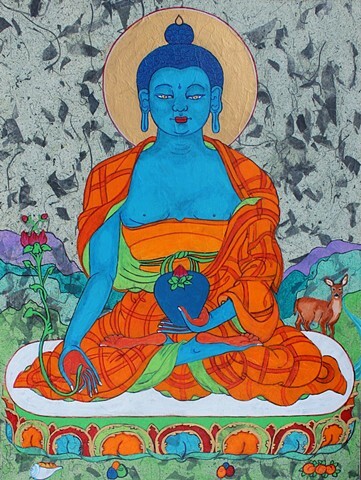 Medicine Buddha is blue in color like the Vaiduriya jewel - lapis lazuli, He holds a begging bowl with a medicine plant and the Medicine flower in his right hand. He sits on a lion throne. May all beings be free from illness and enjoy peace and happiness.